← I Need Moa Fingas! Stay haying time in Damascus. All ova can see da various stages of da harvest. 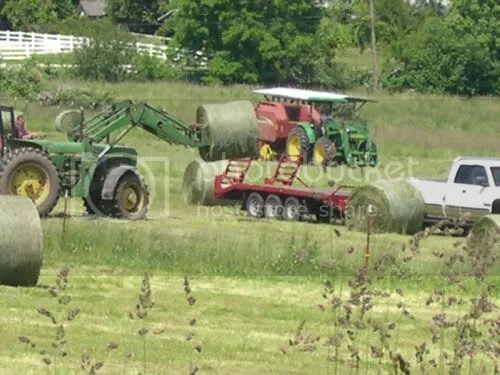 Some places already wen bale and remove da hay. Oddas jass at da point of threshing. Oddas da rows of cut hay lying out in da hot sun waiting foa da tractor to come along and rake um, leaving da rows full of fluffy hay. 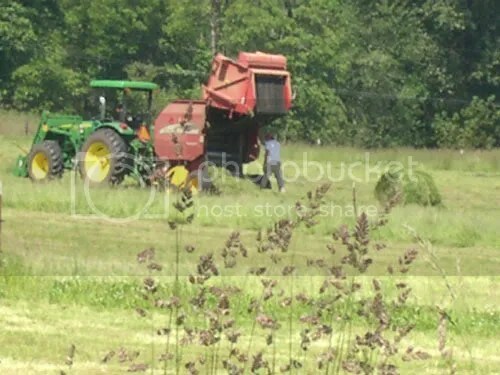 Swallows love haying time! 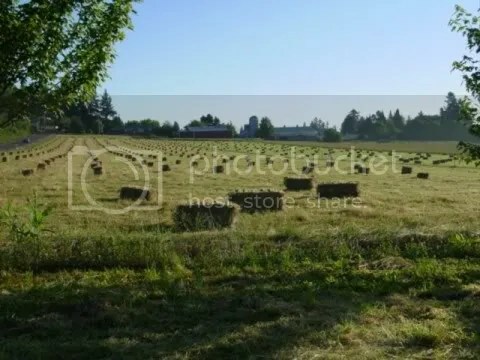 Dey swoop and glide ova da rows, scooping up alla bugs dat thought dey was safe insai da stuff lying on da ground; which dey were, until da hay wen get raked. 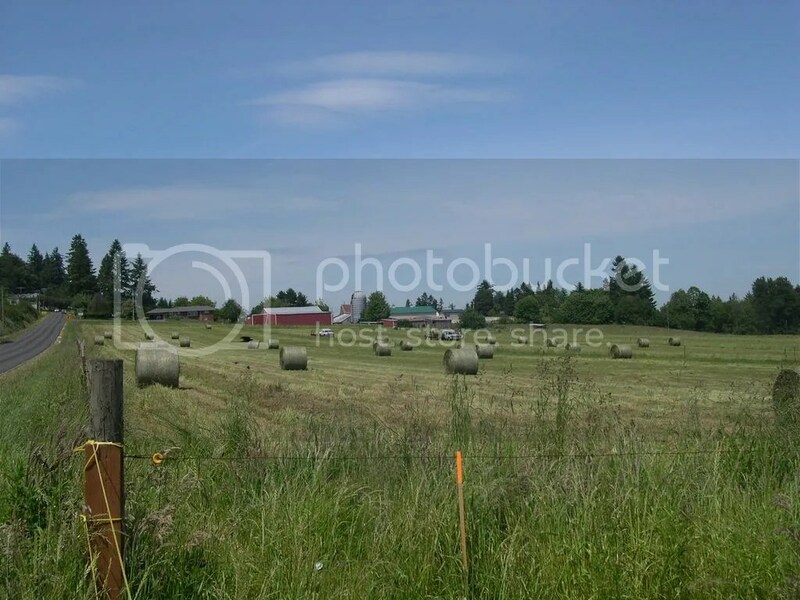 Jass up da road from us get one huge pasture belonging to one Century Farm called Weber’s Dairy. When we firss wen move in hea, about 19 years ago, da Weber ‘ohana still had dairy cows, and we could see dem grazing out in da pasture. Sometimes da Webers wen grow field corn dea, da tall stalks waving in da wind, moa tall den one man. Wen pau da harvest, da owners wen let alla cows into da pasture foa chomp any corn left ova. Just da sight of da cows and da corn wen bring maluhia [peace] to my spirit. Everytime I wen come around da corna from Gresham, I wen look forward to seeing dat pastoral sight. Times wen change. Da Webers wen stop dairying and wen rent out da pasture to anodda farmer who had cows. Nomo field corn wen get planted. 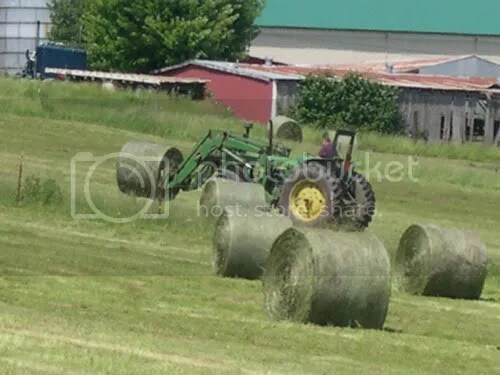 But around dis time of year most years, da haying would begin. But dis year, about two weeks ago, when Nolemana and I stay heading to town, ho, we wen see one new kine bale in da field. Neva befoa had da Webers done dis kine, so of course I wen tell Nolemana, “Eh, I like stop an watch!” Firss I had for race back home to get my camera, cuz I like take photos. I tell u why lataz. We wen watch da tractor lift up each bale wit spesho prongs in front. 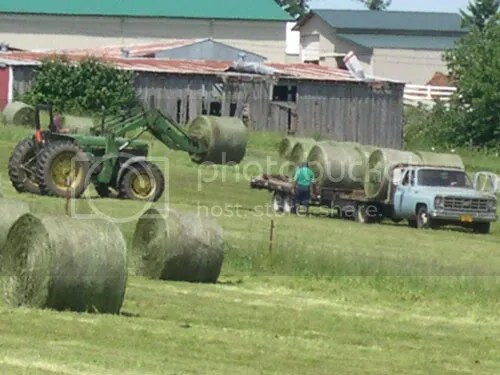 Da truck stay full; now dey going take da bales away. Try watch. 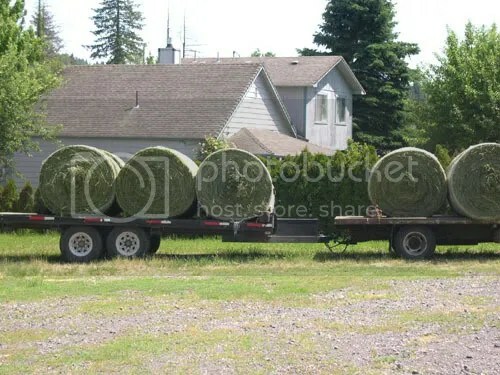 Da bale going come out da back. Kewl, yeah? 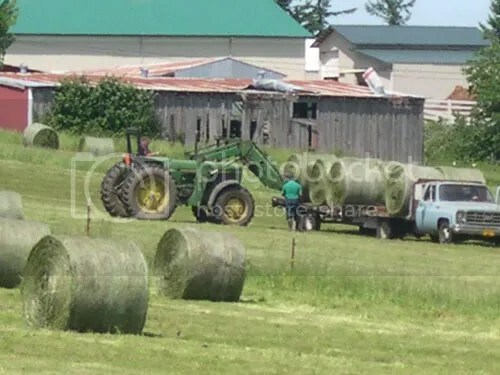 Da odda kane wen continue on doing his job picking up da bales. 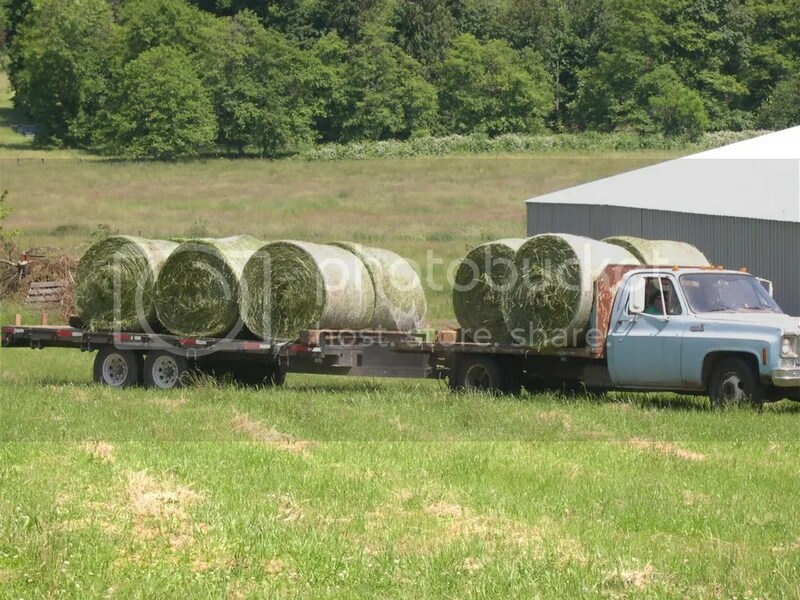 I love haying time. I love da fragrance of da newly cut hay, I love da swallows dipping and gliding as dey search foa bugs. 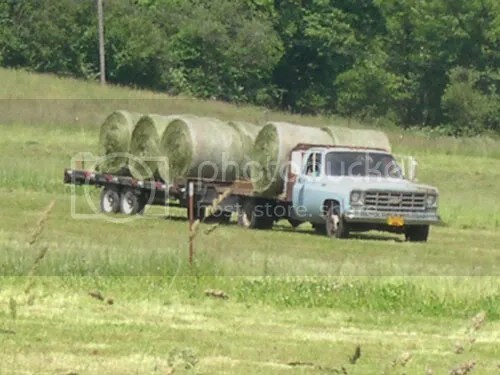 I love da way da bales look. 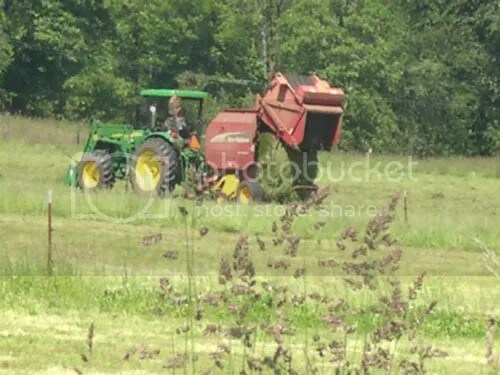 I love da peaceful movement of da machinery working its way up and down da fields. 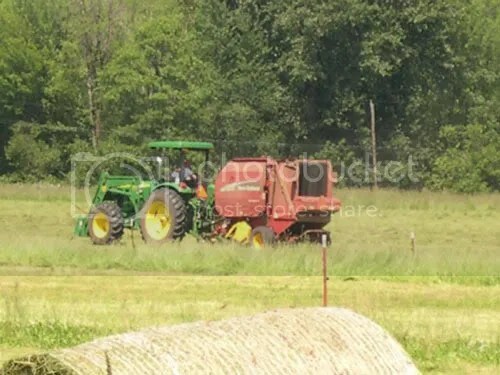 But dis is one bittersweet mele aloha [love song] to haying time in dis field. Why? 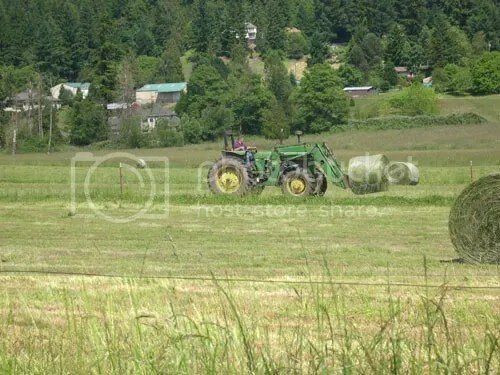 Cuz just a couple of months ago, all dis acreage wen get sold to da Gresham-Barlow School District. In a few moa years, dis lovely view will be nomo. In its place going be one new high school, complete wit football fields, parking lots, classrooms, and attendant traffic and noise. Nomo will cows graze peacefully in dis field. Nomo will da tractors make dea steady way up and down, creating green “Tootsie Rolls”. Nomo will I be able foa take photos of one of my favorite sights in da world. Nomo da Canada Geese going winta hea, honking and calling to each odda as dey munch da winter grass. Aloha ‘oe, Webers Dairy. I get too much wai maka foa write anymoa. That’s what we have over our back fence, cow pasture. Well it used to be. The boys loved seeing the cows back there but I’m sure someone complained (hey the cows were here first!) so they are only there maybe 2 days a year. 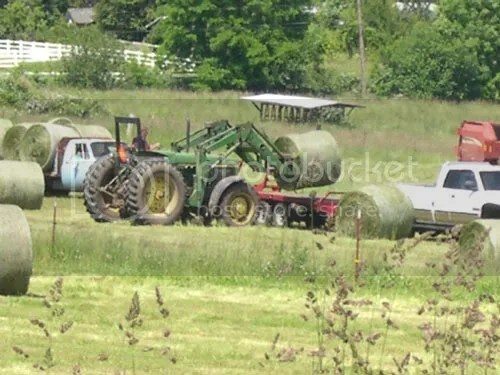 Now they use it for hay, except “Farmer John” as Dh calls him, does the baling and stuff in the middle of the night. Oh da noisy! But hey, he was here first and is only a couple nights a year, can handle that. They have those in OK. In fact dey get da suppa size ones too, twice dat size kine. 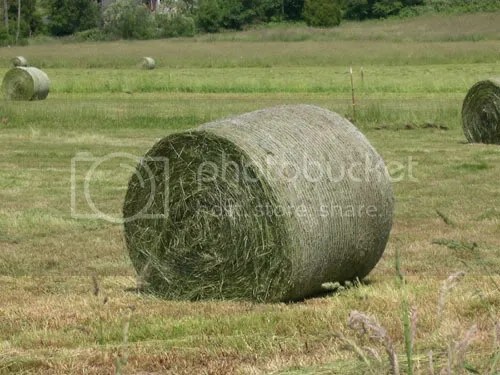 Fresh cut hay/grass smells good. True nature. These pictures are so wonderful. They look like the ones around the corner from us. I know all these things will be missed. May other joys take their place.